Paul’s famous passage read at more weddings than any other passage is describing what it means to love. There are several options to say love in Greek, Paul uses the word which is the most intimate, most benevolent, the most disinterested love. This love is a love for the sake of loving the lover and has no other purpose. Sometimes we love because the person loves us, or maybe we love because we receive something in return. Paul is describing love that is wholly for love. The one who receives this love need not give anything in return. It is the love God has for all His creation. It is Jesus self-gift of the cross. It is a love poured into our hearts through the Holy Spirit which has been given to us as advocate, counselor, who is a free gift. This love, God’s perfect love for us, does arouse love in us for God in return. We see love descending from the Father and that love ascending back to the Father from those who return His love. This love then is inseparable from loving everyone. We cannot love God without loving everything and everyone God loves. @andy_stanley in his new book #ReclaimingIrresistible says it this way, “God’s love for us obligates us to love those who God loves. And who does God love? According to John the whole world.” You cannot share in God’s love if you don’t love all that God loves, even enemies. To love in this way is to be as close to the image of God as we can. 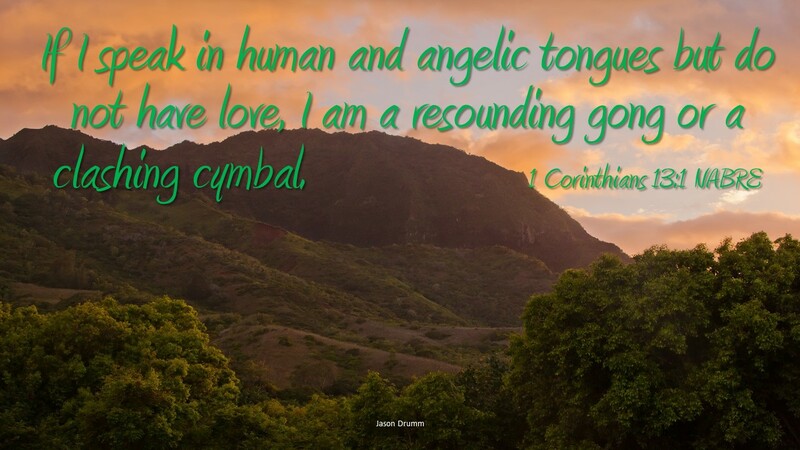 Thus if we don’t have this love we are moving away from God and nothing we say can matter, we are a gong or cymbal making useless noise. To be a follower of Jesus we must experience love for one another, the love God has for us. Who do you love? Who loves you?